What Does Plugin Mode in Easy Social Share Buttons for WordPress? Easy Social Share Buttons for WordPress is social media plugin for WordPress providing all must used functions for social media. No matter your are a novice or pro we have the exact plugin mode that will work for you. 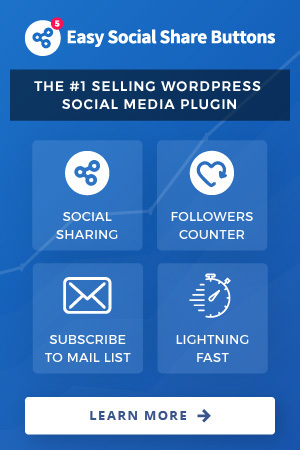 Using plugin modes you can easy adjust plugin from light share buttons with a tiny set of features to a full featured social media solution for every WordPress site. With selection of a working mode you will define the functions you will use – all others will be disconnected from the administrative interface and plugin code. That will make plugin works with everything you need and nothing more. The best is that you can change at any time the working mode without loosing your current made setup. Behind the code each mode deactivates a list of options. If the mode that we have made as base is not exactly for you than the Manage Plugin Features menu will help to deactivate all not used features. The change of plugin mode can be done at any time by accessing menu Switch Plugin Mode. Below you can find a quick compare of existing plugin modes and recommendation for type of usage.